Desktop-files are part of a standard by freedesktop.org for defining the behaviour of applications running on Xorg (an X-server implementation). In an GNOME or KDE environment most applications conveniently include a desktop-file. I mostly write desktop files for GUI applications not coming with one and as a way to connect GUI-users with shell scripts. 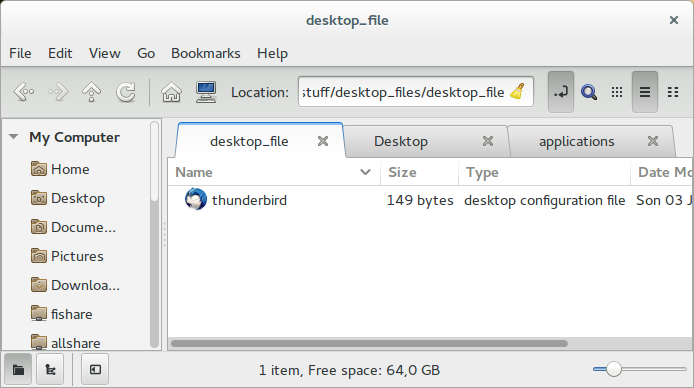 For an simple example let’s assume that on a certain distribution Thunderbird doesn’t come with an desktop-file. Pretty much the only way to start Thunderbird in such a situtation is by typing thunderbird in the command-line. As desktop files define where in the menus/applications a program can be found, without one you won’t find the application in your menus/applications. Especially for inexperienced users this might cause a lot of confusion and ultimately frustration because they downloaded a program they can’t find anywhere. Use chmod +x ~/Desktop/thunderbird.sh to make the script executable. This helps but is no elegant solution. The script has no icon and the user still can’t find the program in menus/applications. A better solution would be to write a simple desktop file like the one below and store it in ‘/usr/share/applications’, we’ll explain the details later. The first line is the shebang which defines how to execute the script, for desktop files #!/usr/bin/env xdg-open is the way to go. The second line is the group header which should be [Desktop Entry]. The following entries are key value pairs defining the behaviour of the application, for a list of valid keys take a look at this specification by freedesktop.org. Placing this simple desktop-file in an appropriate location like /usr/share/applications tells the system how to show call and represent Thunderbird (shown in image below). This way an inexperienced user can find the application in the menus/applications as well as link it to the desktop/launcher or wherever he wants. For adding icons to self-written scripts I google the most appropriate buzz-word and add icon like vnc icon. This usually results instantly in proper icons for my script which I save to /usr/share/pixmaps/ and reference in the desktop-file with Icon="application-name.png".